Alexander Graham Bell was born Alexander Bell on 3 March 1847 in 16 South Charlotte Street, Edinburgh, the son of Alexander Melville Bell and Eliza Symonds. Alexander’s birth was registered in the Old Parish Register on 12 September 1849 at the same time as his older and younger brothers, two years after he was born. It is evident from other Old Parish Register entries that families sometimes waited to register their children at the same time, or were encouraged to do so by the parish minister. Unusually, in this case, Alexander made a solemn declaration before a Justice of the Peace that the information he was providing was true. It is not known why he took this additional step, or whether he was asked to do so by the church. Alexander asked his father for a middle name, like his brothers, and on his eleventh birthday he was allowed to adopt one. He chose ‘Graham’ after one of father’s patients, Alexander Graham, whom the family had come to know well. Interested in sound from a young age, Alexander studied and taught elocution at various schools including a year's placement at Greenock Academy. His father was a Professor of Elocution at the Universities of Edinburgh and London, and his grandfather was a well-known elocutionist and author on the subject. In 1870, following the deaths of two of Alexander’s brothers from tuberculosis, doctors warned him that he was susceptible to the disease and recommended a change of climate for his health. 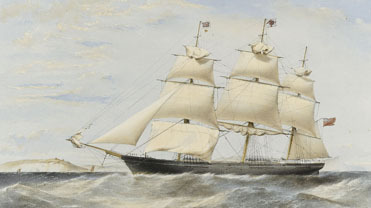 Alexander and his parents immediately emigrated to Ontario, Canada, on board the S.S. ‘Nestorian’. After a short stay he travelled across America, helping deaf people to communicate, before he became a naturalized citizen of the United States in 1874. On 2 June 1875 Bell’s first membrane diaphragm telephone transmitter produced speech sounds, and on 10 March 1876 over the ‘Liquid Transmitter’, the first intelligible speech over a telephone was achieved when the words ‘Mr Watson, come here, I want to see you’ were successfully heard at the end of the line. He patented his devices in the US and Britain. Throughout his life, Bell explored his interests which included aeronautics, hydrofoils and telecommunications. Together with his assistant, Charles Sumner Tainter, he developed the Photophone; a device similar to a telephone but which also modulated light as a means of wireless transmission. On 3 June 1880, Tainter transmitted a wireless voice telephone message over a distance of 700 feet; this was the precursor to fibre-optic communication systems. In a letter to his father on 26 February 1880 Bell wrote to his Father 'I have heard articulate speech by sunlight! I have heard a ray of the sun laugh and cough and sing!...I have been able to hear a shadow and I have even perceived by ear the passage of a cloud across the sun's disk. You are the grandfather of the Photophone and I want to share my delight at my success.' He believed this to be his most important invention. On 30 November 1920 Bell received the freedom of Edinburgh. During his stay he visited the Royal High School, which he had attended between 1857 and 1862 and began to be interested in invention. He fondly said that he had been a loyal citizen of the United States for fifty years but he had always a warm spot in his heart for his native land. He died at his home in Nova Scotia, Canada, on 2 August 1922.